The music of Francesco Barsanti is an inspiring combination of art music and folk music and the man himself had a fascinating life. Unfortunately there is not much known about Barsanti’s background. His father may have been the opera librettist Giovanni Nicolao Barsanti who wrote “Il Temistocle”, but sadly this has never been proved. Like many composers, Francesco Barsanti studied law as a young man but abandoned it to pursue a career in music. In 1714, Barsanti made the bold step of emigrating to London with his older colleague from Lucca, Francesco Geminiani. Playing oboe and recorder, he soon bagged a job in the prestigious Haymarket opera orchestra, performing Handel operas. There are reports that he then returned to Lucca in 1717 and 1718 to play in the festival of the Holy Cross for reportedly a rather high salary! Having made his mark in London, Barsanti moved again in 1735 to Edinburgh where he became a ‘Master’ with the Edinburgh Musical Society. Scotland was Barsanti’s home for eight years and he married a lady called Jean there, about whom sadly no further information is known. He may have had support from Lady Erskine(Charlotte Hope) (1720-1788) as he dedicated his famous collection of Old Scots Songs to her in 1742. Unfortunately the Edinburgh Society was not well off financially and in 1740 Barsanti’s salary was halved to £25 with his repeated requests for a pay rise refused. ing in Handel’s opera orchestras and sadly was unable to eke out any income from his earlier compositions nor for the two works he composed after his return. ying recently is particularly evocative with its folk style Gavotte with Variations. 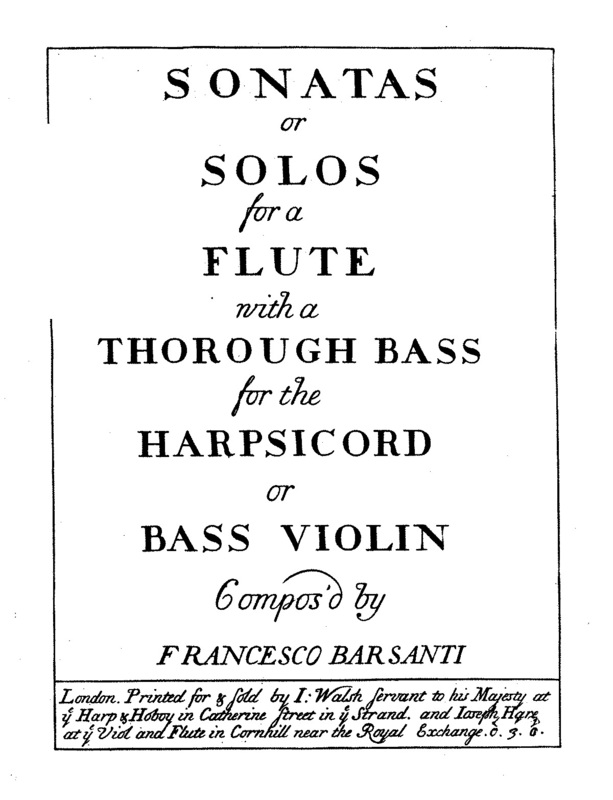 Barsanti had a real feel for the tone colour and capabilities of the recorder and there are fascinating effects such as double stopping in the bass part. Unbelievably the Sonatas were not performed in modern times until 1940 when the musicologist and recorder player Walter Bergman rediscovered them and published three of them for Schott. 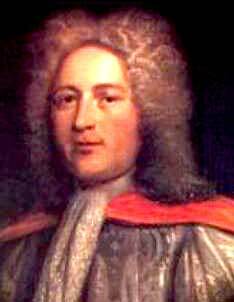 William Croft (1678–1727) was the most successful English musician of his generation. His style forms a natural bridge between that of Purcell and the High Baroque. He composed works for the funeral of Queen Anne in 1714 and for the coronation of King George I the following year. His Burial Service (1724) described as “a noble classic of moving simplicity” has been used at state funerals ever since its publication. Croft’s upbringing was unquestionably privileged—born into an ancient, landed family in Warwickshire, he was educated at the Chapel Royal, where he served (from 1700) as Gentleman of the Chapel Royal and later (from 1704) also as organist. In 1707 he assumed the post of “Master of the Children”, and the following year succeeded Blow (his teacher) as organist of Westminster Abbey. He was deeply interested in the music of his predecessors, inspiring him to become one of the founding members of the Academy of Vocal Music (later the Academy of Ancient Music)—other members included Pepusch, Bononcini, and Geminiani. He was buried in the north aisle of Westminster Abbey close to Purcell and Blow, where a monument was built in his honour. His secular songs are written in a similar vein to those of John Blow and Henry Purcell. Short arioso sections are interspersed with brief recitatives. Croft does shift the emphasis towards melodic structure rather than straightforward word-painting at any cost—yet his music is still engagingly programmatic and includes the odd nod towards Purcellian harmonies. By Purling Streams is published by Green Man Press and is included in our South Sea Bubble programme. The oboe d’amore is pitched a minor third below the oboe and has a bulb bell or Liebesfuß rather than the flared bell of the oboe. 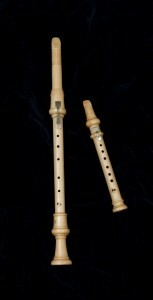 It is an instrument of the German high baroque. Christoph Graupner seems to have been the first composer to have specifically referred to the instrument: it features alongside the viola d’amore in his aria Gott wolle unserer David schützen from the cantata Herr unser Gott of 1717. 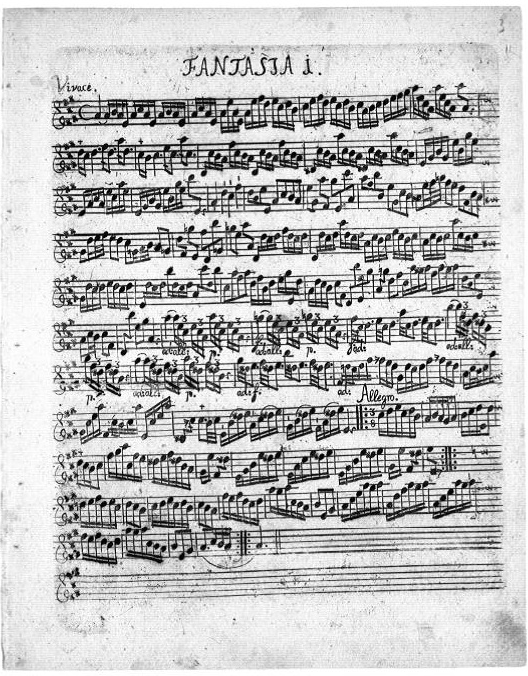 Although Telemann, Graupner, and the Grauns all wrote for the oboe d’amore, it is the choral works of J. S. Bach which account for the largest share of the surviving repertory. From the mid-century on, the instrument gradually fell into disuse, and was only revived—for the purposes of performing Bach’s newly-fashionable music—in the nineteenth century. The pastoral associations of the oboe d’amore, which are emphasised in the Telemann concerto included in our programme Beyond the Court, find echoes in twentieth-century pieces such as Holst’s Somerset Rhapsody and, most famously, in the opening solo of Ravel’s Bolero. Here at Concentus VII we branch out into the more obscure instruments of the Baroque from time to time. One of these is the chalumeau, basically a clarinet without its high register, which Louise plays for example when we do our Beyond the Court programme in a piece by Hasse for bassoon, viola da gamba, oboe, chalumeau and continuo. For the 21st century Baroque fan the chalumeau is a very accessible instrument – it’s affordable, easy to transport and because it has minimal key work is capable of subtleties that are not always easy to produce on later clarinets. Johann Jacob Fux (1660–1741) stands at the apogee of the Austrian baroque, the musical embodiment of the Hapsburgs’ world; J.S. Bach placed him first among his contemporaries. At some pint during his early career he made a trip to Italy and fell under the influence of Corelli and other contemporary Bolognese composers. Fux was an expert on Renaissance polyphony, a theorist famed for his work “Gradus ad Parnassum”, the single most influential treatise on counterpoint in the style of Palestrina and a work of arresting clarity which has endured centuries of changing educational styles to blight the lives of music students today. The book takes the form of a dialogue, between a master and a student, by implication Palestrina and Fux himself. At the outset Fux states his purpose: “to invent a simple method by which a student can progress, step by step, to the heights of compositional mastery …” To give him his due, Haydn taught himself counterpoint by reading it and recommended it to his pupil Beethoven, and Mozart carefully studied and annotated his own copy which still exists; Fux’s text played a major role in the development of Western musical thought, perhaps because it is a very hands on, almost modern work with the emphasis on practise rather than pure theory. 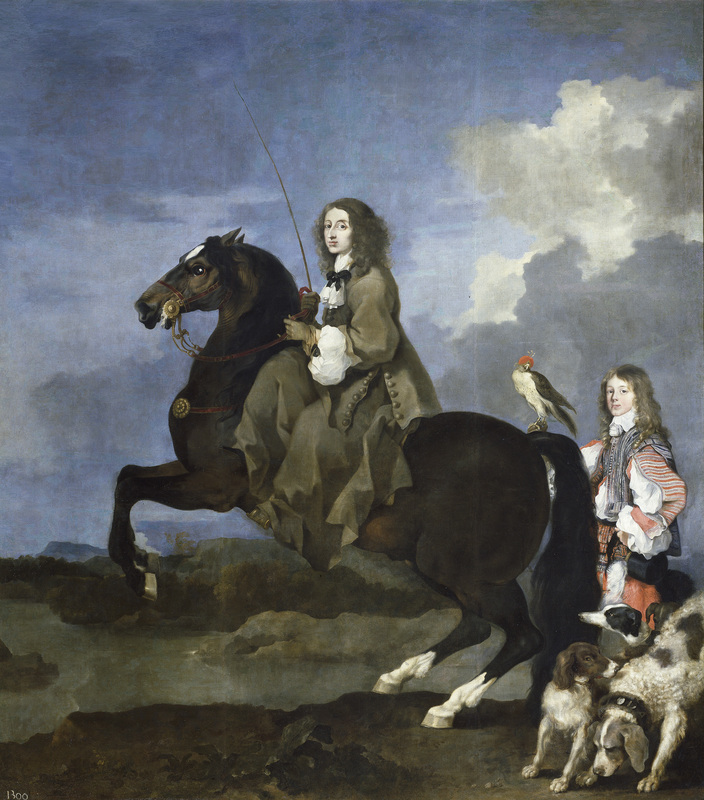 By the 1690s he had moved to Vienna where the Emperor Leopold I was was sufficiently impressed by his work to appoint him court composer in 1698, despite opposition from the resident bevy of Italian musicians. They slated the first work the emperor had them perform, so the wily old sod passed a second mass as the work of an anonymous Italian. It was acclaimed and Fux bagged the job. Fux’s music is notable for its complex contrapuntal textures, florid Italianate ornamentation and striking vocal and instrumental rhetoric. He was fascinated by the synthesis of national styles, so clearly demonstrated in the trio sonata Concentus VII, a tableau in which Italian and French musicians vie for superiority, eventually discovering that they can work together. The two play an air together, each in his own style, and all ends amicably. 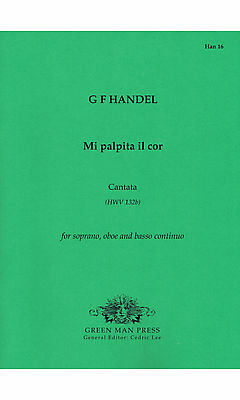 Mi Palpita il Cor is an extravagant and virtuosic work—its languid, indulgent opening aria and tempestuous finale are punctuated with impassioned recitative. One of several re-workings of an earlier cantata written in Rome, Handel was evidently very pleased with it; he re-arranged the work four times for a variety of different instruments and re-used the music once again in his Oratorio Samson. Telemann was one of the most prolific composers of recorder music — it’s hard to learn the instrument without coming across his works. He can be unjustly maligned by Baroque specialists as less interesting than Bach or Handel but his sense of wit and invention is incredible. He was very much an entrepreneur, publishing his own works to meet the incredible demand for them. I first encountered Telemann through his solo Fantasias aged about 15 and now teach them to my own teen-aged students. They play them a minor third higher but when I play them now I mostly use a voice flute to play them in the original flute versions, keeping the sense of key which was an important aspect of rhetoric and used to great effect Baroque era. It’s a pleasure to explore the colours of dance movements and folk inspired extracts as students begin to get beyond the notes. Over the years I have enjoyed performing Telemann’s Cantatas, Sonatas and other works in many combinations, not forgetting the pastoral tour de force, the Concerto for two Chaumeaux. Telemann’s use of the high register of the recorder is unrivalled and provides a neat solution to the inherent problems balance between the recorder and the naturally stronger baroque oboe. I am lucky enough to have a Denner copy alto made by Von Huene workshop with a perfect clear high register. When we recorded the Telemann Trio Sonata in A minor in 2009 we were blown away by the sound of the intense slow movement with its interlocking oboe and recorder lines in the atmospheric venue of Toddington Church. 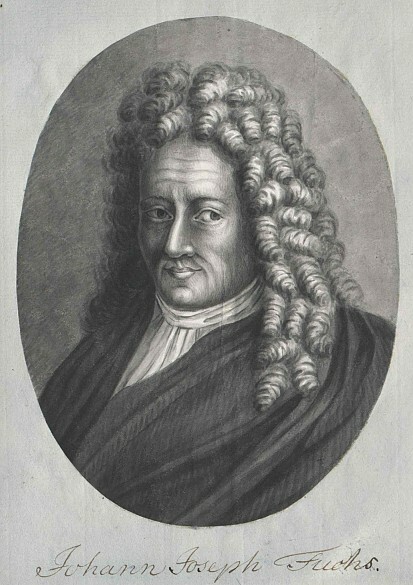 Johann Christoph Pepusch (1667–1752) was born in Berlin, the son of a Protestant minister. He left Germany in search of a more just society after witnessing the execution without trial of a Prussian officer accused of insubordination. He arrived in London at some point around 1697, where he remained for the rest of his life. Pepusch worked his way up from the lowly rank of viola player to become the director of music at Lincoln’s Inn Fields. 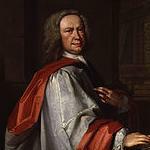 His interest in music was both worldly and academic; in 1713 both he and William Croft were awarded the degree of DMus at Oxford, and late in his career he was elected a Fellow of the Royal Society, to whom he delivered a paper entitled “Of the Various Genera and Species of Music Among the Ancients”. At the same time he built up a reputation as a composer of instrumental music, a performer and impresario. Pepusch’s cantatas are Italianate in structure, but uncompromisingly English in style. He chose to set English texts because he wanted his audiences to understand the words—unfortunately he chose texts that were opaque to the point of illiteracy. The music is another matter, it bewitchingly, breezily Arcadian. Corydon (featured in our South Sea Bubble programme) is taken from a collection of six cantatas dedicated to the Duke of Chandos, his patron. He was employed alongside Handel at Canons, Brydges estate near Edgware in Middlesex, where these works were first performed. James Brydges was created first Duke of Chandos in 1717 “for no particular reason”. He speculated recklessly, firstly with the money accessible to him in his post as Paymaster General (a dodgy practice if ever there was one) and later, pocketing the profits, with his own dubiously gained but stupendous wealth. He invested particularly heavily in the South Sea Company and suffered major losses when the South Sea Bubble burst and was forced to dispense with his extensive retinue of artists, writers, architects and musicians, Pepusch and Handel among them. Pepusch re-focused his attention on the theatre. He collaborated with John Gay to produce The Beggar’s Opera—a satirical take on corruption at the core of the British establishment. It remains his enduring legacy, although his input was very limited. Its influence is apparent in the works of Gilbert and Sullivan, and it was re-vamped by Brecht and Weill in 1928 to become Die Dreigroschenoper. It had the longest theatre run of any production up to that time. Robert Walpole (Britain’s first Prime Minister, and principal victim of Gay’s libretto) made sure that it’s sequel, Polly, was censored. Pepusch seems to have stopped composing altogether after 1729 in order to fully indulge his scholarly interest in the music of the past, and to promote The Academy of Ancient Music, of which he was a founding member. He amassed an extensive collection of books and music, including the collection of music for the virginals now known as The Fitzwilliam Virginal Book. The Pontificia Accademia degli Arcadi (The Academy of Arcadia) was an Italian literary society established in Rome in 1690, although its origins can be traced back to February 1656, when a literary circle formed around the patronage of Queen Christina of Sweden. A Catholic convert who abdicated her throne in 1654, she took her entourage to Rome where she established herself as a great patron of the arts. Alessandro Scarlatti, Alessandro Stradella and Arcangelo Corelli all benefited from her largesse. Christina died in 1689 and the academy was established in her memory. The Academy’s purpose was to reform Italian poetry which they thought had become too extravagant and flowery. The Academy advocated a simpler, direct style and to this end took inspiration from the simple lives of peasants—an idealised world of rural innocence peopled with shepherds and nymphs and burbling streams; in short a recreation of an imagined Arcadian Golden Age replete with classical forms and mythological themes. In 1696 the Academy admited seven musicians including Giovanni Bononcini – later disgraced and discredited as a plagiarist when it transpired he’d passed off Lotti’s work as his own. It was considered a great honour to be invited to join this club, and it survived well into the 20th century. In 1925 the Academy was renamed the Accademia Letteraria Italiana and became an historical institute. George Frideric Handel attended meetings of the Arcadian Academics while he was in Italy; Alessandro Scarlatti was also a member. The other works in our programme are all based on the pastoral themes typical of the Academy’s house style.